Here it is, the moment we had all been waiting for. 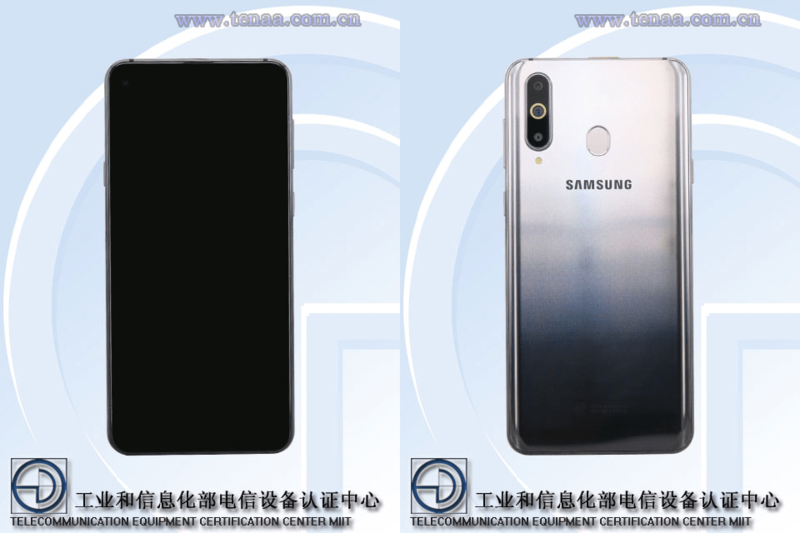 Thanks to China’s regulatory body TENAA, we are getting our first look at the actual Galaxy A8s and at Samsung’s implementation of a display with a hole for the front camera. 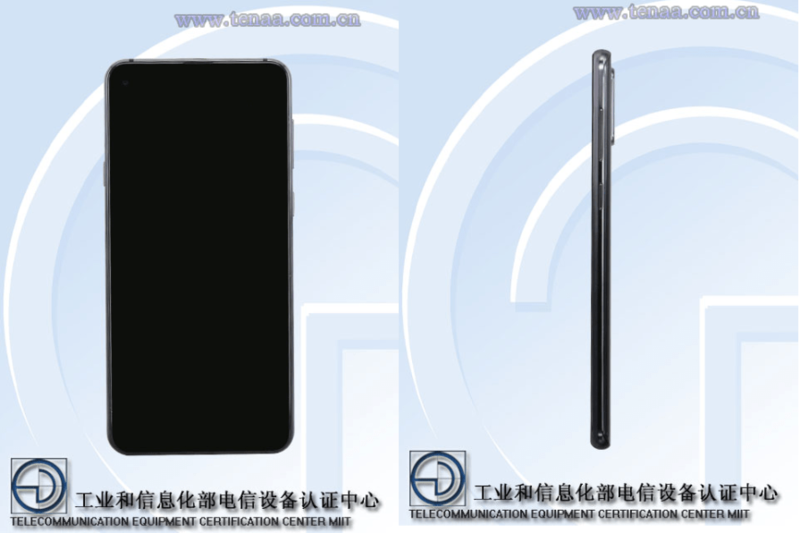 The images published by TENAA are rather dark, but peek at them hard enough and you can see the in-display camera and even Samsung’s new earpiece design. In fact, the Galaxy A8s also has a few interesting design cues on the back. The middle of the three rear cameras has a yellow ring around it, and the only thing that comes to our mind is that Smart Glow feature that Samsung had introduced to its budget phones a couple of years back. That ring was much bigger, though, so this could probably just be a design element that serves no functionality. The shape of the fingerprint sensor is also different. Samsung seems to have rotated the fingerprint sensor seen on devices like the Galaxy A8 Star by 90 degrees, which it will hopefully result in better accuracy. And the gradient silver color also looks quite good. It’s classy and less funky than the brighter gradient colors Samsung has offered for some of its recent phones, although we’re guessing the other Galaxy A8s color options will include some bright options as well. Like the Galaxy A7 (2018) and Galaxy A9 (2018), the left side of the phone only houses the Bixby button, which should make it harder for users to accidentally fire up Bixby all the time. The TENAA listing also mentions the Galaxy A8s’ screen size and battery capacity. The 3,300 mAh battery is the same as the Galaxy A7’s while the display is slightly bigger than the A9’s at 6.39 inches. Dimensions for the phone are 158.4×74.9×7.4 mmm. Other specs aren’t mentioned, but rumors suggest the device will have a Snapdragon 710 SoC, 6GB of RAM, 128GB of internal storage, and a 24-megapixel front camera. The rear camera setup will include a primary 24MP lens, a 5-megapixel depth sensor for Live Focus photos, and a 10MP ultra-wide sensor. Since these images don’t have the phone powered on, we can’t tell how the camera hole will affect the user experience. The A8s’ FCC listing gave us a hint, and the phone’s official announcement on December 10 will give us all the details. What do you think about the Galaxy A8s based on these pictures? Could the designer team be more creative for the back design? Samsung midrange back design is slowly getting more similar to Chinese phones design. Moreover, it looks like a phone that has lost its identity! Will be for this launch event and livestream ? It is quite interesting all these leaks come from China – especially considering Huawei’s ambition to be the biggest producer and all the fuss about industrial espionage ??? Why leaks not come from Korea ? Samsung home country. Yes there is and even if it there wasn’t it does look like an iphone X and most of its copycats. why not put the camera lenses on the centre?